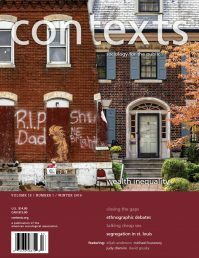 The results of the Contexts Graduate Student Editorial Board study, which collected data on the sociological books people actually take home from bookstores, suggest some further conclusions. The main finding of my study and the Contexts update is that sociology simply does not attract many general readers outside the classroom. This is not likely to change in the next decade, when I hope Contexts will undertake another study on this subject. Perhaps by then sociology will make itself socially more useful and will attract more general readers. How might that be done? I think researchers should become more excited than they are now by topical issues, those that interest and concern general readers. Not momentary issues but persisting ones, of which there’s never a shortage. Subjects and issues that are or should be on the agendas of policy makers, politicians, and social movement leaders ought to be of higher priority in our research as well. Further, general readers may be attracted if sociology sticks to what I believe it does best. Sociologists have always distinguished themselves through empirical research about the patterns and problems of everyday life. We do especially well by talking and listening to ordinary, rank and file Americans at home, in their workplaces, and in the organizations in which they are active. We have gone “backstage” to help demystify important (and self-important) institutions, and we could do more, right now especially among multinational corporations, hedge funds, major Washington lobbies and the like. We ought to put more effort into debunking insufficiently wise conventional wisdoms and correcting inaccurate stereotypes as Barry Glassner has done exceedingly well in Culture of Fear. And we should pursue the original ideas that result from looking at society from new angles—especially bottom-up ones. The ethnographic studies and in-depth interviews in which sociology has specialized allow us to get close to the people that constitute society. These methods also produce rich data and new insights that give us a leg up on the other disciplines seeking to reach the general public. If authors follow these kinds of leads, some will wind up with important books and perhaps even a few influential ones. Enough authors going in this direction will lead to a socially more useful discipline, raising sociology’s reputation and heightening its intellectual standing. Sociologists should, however, be the first to realize that progress is rarely achieved by individuals alone. As I have suggested in recent articles on public sociology and public ethnography, our discipline must offer institutional support, too. Sociology should provide the same kind of training and career advancement for the research and writing I have advocated as for contributions to theorizing, methodological work and empirical studies that contribute to the disciplinary “literature.” Students and professors must be encouraged, funded, and otherwise rewarded for work on topics and issues that are relevant, useful, and accessible to people outside the disciplines. Then the editors, reviewers, and other gatekeepers who publish the general magazines and books serving the lay public may pay more attention to sociology than they do now. And who knows. Sociologists may even sell more books! Herbert J. Gans is a professor emeritus in the department of sociology at Columbia University. He is the author of Imagining America in 2033 and a past president of the American Sociological Association. I yield to your research and the results that were concluded. But I beg to differ on rather a single sociologist can jump start the major and turn academia upside down. I wish life worked in increments, where I could throw my hat in the ring, and demonstre, by example that Sociology is an attractive major, that has existed on the fringe for so long, those who are inside the bubble perhaps operate as if the fringe is where it belongs (total and complete generalization). As an undergraduate, my professors and grad students were some of the top, bar none. But their low key demeanors, melancholy voices and lack of appearances at high level events, attributed to the false impression that Sociology as a major makes no real sense. But who am I to sit back and judge. I am proud to be soc major but haven't necessarily done any thing to promote it (other than some well received comments in reddit . But thank you for your service and your study. I found it quite interesting.